Veg growing gardeners get it in the neck for growing potatoes. Emma Birchley the East of England Correspondent for Sky News’ has got a new blight story, it is either feast or famine when it comes to the potato. ‘Allotment holders who fail to deal with blight-ridden potato plants have been blamed for spreading the fungal infection to farmers’ fields. If it is not detected, blight can destroy crops and the spores can quickly spread 30 miles or more in the wind. 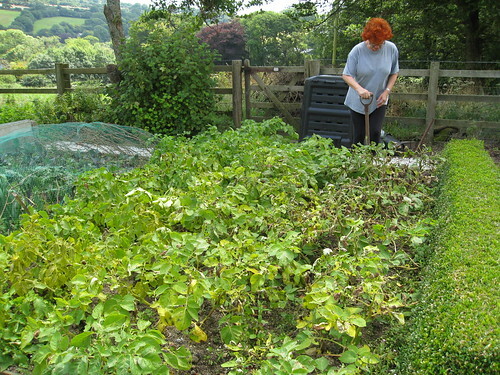 Tackle it the right way and it can be controlled, but the Potato Council says some home and allotment growers are failing to spot the signs in time. “If someone on an allotment has a blighted plant, a single leaf on that plant can produce 120,000 spores,” said the organisation’s director Rob Clayton. The muggy, damp conditions of this summer have been the perfect breeding ground for the fungal infection. Susanna Colaco has had an allotment in Cambridge since 1986. She has never known a year like it for blight. But she is angry that the finger is being pointed at growers like her. “I think allotment holders are very responsible. That foliage must then be burnt, deeply buried or binned. It can even go in the council’s compost bin as the contents are heated to a high temperature. But infected leaves or rotten potatoes must never be put on the compost heap. “If somebody throws a rotten potato on a compost heap at this time of year it can sprout … and it can kick off a whole cycle of infection from next year on,” said Mr Clayton. Late blight, as it is known, or phytophthora infestans, is the type which destroyed vital potato crops in Ireland in the mid-19th century causing the Great Famine. A million people died. Farmers expect to lose around 7% of their crop to blight, but this year the loss is predicted to be more like 10%. And the usual £55m cost of coping with the fungal infection is likely to increase to around £80m. 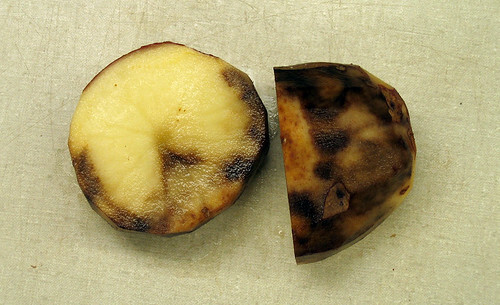 You can get blight buster potato tips and information for gardeners here….